On Thursday July 27th I took the ferry to England to serve as pallbearer at the funeral of a dear friend. Not the most enjoyable trip to make. But this was an honour, and my duty: I needed to be there, for Albert. For Sgt. Albert Figg, commander of a 25-pounder gun, 112th Field Artillery Regiment, 43rd Wessex Division, at Hill 112 in the Odon river valley below Caen, capital of Normandy. Under the circumstances, one can hardly describe a funeral as “wonderful”. Yet this was the exact case. I witnessed an emotional, moving and sometimes funny tribute to my dear friend. All involved did their utmost best, and I was especially moved by the tribute by Albert’s old friend Maurits Huybrechtse, saying: “we will now take over, Albert.” As usual (I am referring to the annual D-Day ceremony in Normandy) , the Revd. Mandy Reynolds’ service was impressive and, to me personally, comforting. I was so glad she was there for Albert. Albert Figg was my hero. Befitting, he got a hero’s funeral: family, friends from abroad, the “last post”, veterans, standard bearers etc. The 25-pounder, quad and limber were a sight to behold, and the crew did a marvellous job. Through Canterbury, all the way up to Barham Crematorium. What a sight! How Albert would have loved all this! Not for himself, but any publicity was always welcome to put his comrades-in-arms at Hill 112 in the spotlight. We would like to most sincerely thank Andy Thomas and the Stoodly family in fulfilling Albert’s last wish by taking him on his last journey with the Quad, Limber and Gun, just like the one he used in WW2. Its the same one that Albert would stand up in whilst being driven around the arena at the Combined Ops, Headcorn, invariably advertising his latest project. The last one was to advertise his life story just last August. It was then that he asked Andy and his mum, Vicky, if they would use it for his funeral. Andy is the owner of the FRS Collection of WW2 equipment, who with the help of family, maintains the quad, limber and gun. The collection is preserved and exhibited for the benefit of historians, students and past and serving Royal Artillery personnel interested in the equipment and its history. I am carrying on from my first blog post. It was 6 weeks of hard fighting, with so many dead and wounded, and by the 23rd august, the enemy had withdrawn from the hill. It is without any doubt this was the start of the end of the war, the next battle was [Operation Bluecoat] whereby the 43rd was again in another battle for Mount Pincon. Also Operation Goodwood, the battle to close the Falaise Gap by the 11th armour division, who suffered very heavy loss of tanks. With the slaughter of Canadian and Polish infantrymen, Goodwood was completed by the 20th August – it was a disaster! After the crossing, we now go into operation Market Garden. There is more, but for this time that is as far as I am going. If you unable to wait, may I suggest you buy my life story-book, by going into website; albertfigg.co.uk where you buy it by clicking onto PayPal. I WILL NOW GO BACK TO THE DAY OF MY LANDING,IT AS ON JUNE THE 24th ON GOLD BEACH, I WAS A SERGEANT GUNNER IN THE 112 FIELD REGIMENT 43th WESSEX DIVISION. OUR FIRST ACTION THE EVENING WAS TO SUPPORT THE 15th SCOTTISH DIVISION, WITH ANOTHER 64,000 MEN IN OPERATION EPSOM,THIS WENT ON FROM THE TH 5th JUNE UNTIL THE 30th OF JUNE, FROM THAT DATE THERE WAS WHAT WAS KNOWN AS A STALEMATE BETWEEN THE 5th OF JUNE AND THE 10th OF JULY, ALL WE WHERE DOING WAS HOLDING 7 PANZER DIVISIONS, WHILST THE TWO AMERICAN DIVISIONS WHO LANDED ON OMAHA BEACH AND THE OTHER LANDED ON UTA BEACH, WHERE MAKING THEIR WAY TO THERE WAY FORWARD TO CAPTURE THE PORT OF CHERBOURGE. Albert Figg has a story to tell, and it’s a good one. His memoir, The Ups and Downs of a Gunner: My Life Story, is a quirky, no-nonsense look at how an ordinary man became caught up in an extraordinary time. Born in Wiltshire, England, in 1920, Albert was the youngest of eleven children. His childhood was spent learning how to milk cows and harvest hay, frolicking in the fields picking blackberries and apples, going to school, and getting into mischief with his friends. But when Hitler came to power in 1933 and in the years that followed, Albert became intensely aware of the rumblings of war coming from Germany. And in February of 1939, to avoid being drafted, Albert enlisted with the Royal Artillery, 112 Field Regiment, of the Territorial Army. During the war, Albert trained in preparation for the invasion of Europe, climbing to the rank of sergeant in less than three years. He and his crew landed on Gold Beach at Normandy on June 24, 1944, and would go on to be involved in the attacks on Hill 112 as part of the 43rd Wessex Division. Following his service in Normandy, Albert participated in Operation Market Garden and the Allied advance into Germany. After the war ended, he became part of the British Army of Occupation Rhine. He was discharged in February of 1946. 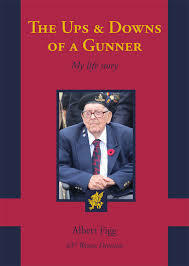 The Ups and Downs of a Gunner also delves into Albert’s post-war life. He details post-war Britain and the political upheaval that occurred after the war, as well as his new role as a father and husband. In his later years after his children were raised and he retired, Albert focused on memorializing the 43rd Wessex Division and remembering the sacrifice of those who fought on Hill 112, a mission he still continues today at the age of 97. What is most enjoyable about Albert’s book is its folksy, down-to-earth style of storytelling. It’s easy to imagine Albert telling you his tale while the two of you sit ensconced in wing-back chairs in front of a roaring fire on a chill English evening, with tea and biscuits close by. Albert is witty and charming in his descriptions of his life, and his anecdotes are vivid and at times, downright hilarious. Yet when the subject arises, Albert does not shy away from the horror of war. This is a heartwarming, fun read about an Englishman’s life before, during, and after World War II. Thank you, Albert, for writing your story.